Mark Bulwinkle reviewed by the Tileista. “At first glance the artistic world of Mark Bulwinkle appears happy. Animals cavort, flowers bloom, a boy has hearts for eyes, the sun shines. The cartoon-like images seem to be laughing at us, as if there is some private joke incised into each of them. Upon closer inspection, an energy emerges with manic overtones. We notice that a cat is blind, a dog appears rabid, a grin seems more like a grimace, and a trio of menacing beasts swallow each other whole. 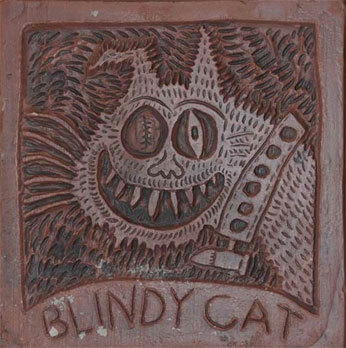 The flat, graphic images in Bulwinkle’s ceramic art emerge from his background in printmaking. From paper to ceramic, by way of steel and rust, the journey’s narrative imagery is rooted in the perennial perspective of a 13-year-old boy, crafted by an adult.